Art Shows featuring artists Robert Munn & Sara Cook. 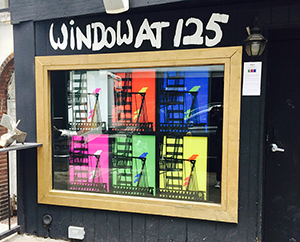 The Roger Smith Hotel Presents in their Premiere Art Window, "The Window At 125" (125 East 47th Street in NYC) Three Dimensional Lenticular Art Exhibit By Robert Munn And Sara Cook Begins April 1, 2014. "EXHIBITION ULTRADELIC & BEYOND" - Robert Munn & Sara Cook of The Depthography Group Retrospective 3-D Art Show at The Gershwin Hotel May 11- June 16, 2010. Elevator installation in the Gershwin Hotel Elevator & a few images from our latest Solo Art Show. March Is 3D Month at Theatre 45 Bleecker/ Follin Gallery -Robert Munn & Sara Cook Solo Show Opens March 3rd, 2010 through April 12 ! Coney Island Museum-Robert Munn, Sara Cook, viewmaster too ! Click here for the Robert Munn bio. Click here for the Sara Cook bio. Â© 2019 DEPTHOGRAPHY, Depthography, Inc., Depthography Group, Virtual Image Gallery, graphics, layout, & content are copyrighted & registered trademarks of Depthography. All rights reserved.